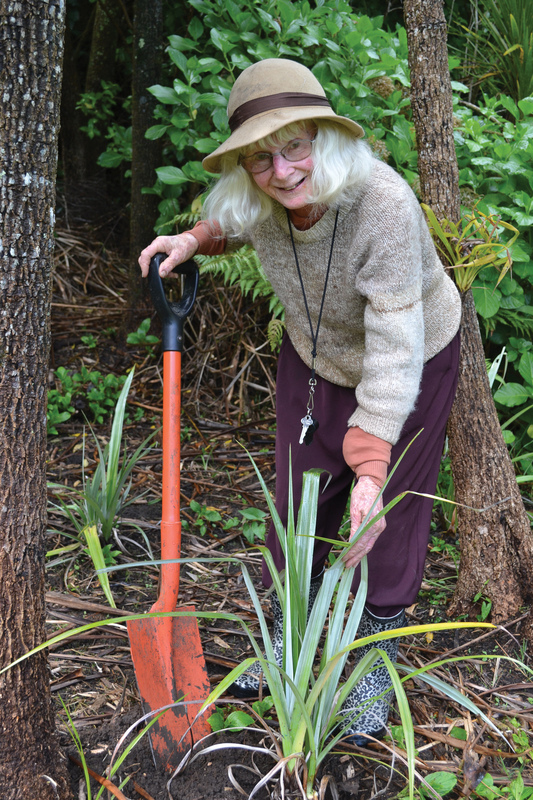 A flax-planting ceremony at Wainui Bush Park on Monday morning celebrated the 25 years of hard work and dedication the ‘Friends of Wainui’ have put into making the idyllic native reserve – dubbed Raglan’s best-kept secret – what it is today. Spade-wielding nonagenarian Betty Rawley – sporting a wide-brimmed sunhat and patterned gumboots – planted a flax firmly into the ground to mark the milestone, cheered on by a good turnout that included a few former ‘Friends’ who had envisioned the park back in November of 1993. Now, all up, 25 astelia or silver sword flaxes are planted beside the park pond to mark that quarter century it’s taken the ‘Friends’ – all of them volunteers – to fully develop the 10 hectare site. 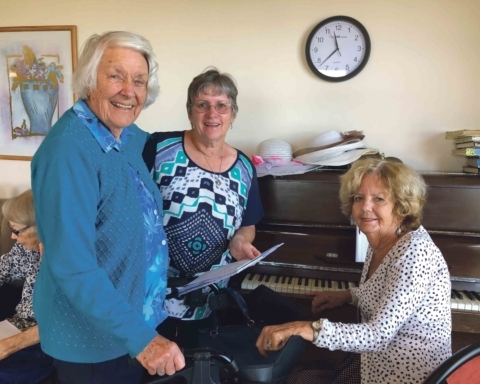 Betty was one of the first involved in transforming the once overgrown farmland, which had been destined for grazing if the then Raglan County Council had its way. 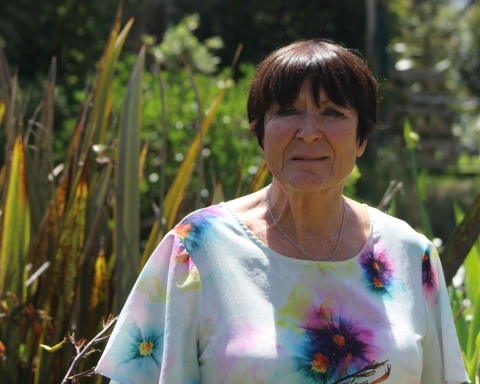 She told the 30-odd ‘Friends’ and others seated near the pond and fountain that “one of my earliest memories is of the Maori’s huge potato plantation there (in the clearing),” adding how she must’ve been very young then. She remembered the first walking track being “at the top of the ridge” where flaxmill workers from Kopua Pa used to camp. A few other original volunteers reminisced on construction of the bush park back in the day. Felix Davy, now nearly 90 and living back in Hamilton, remembered designing the millennium pond and fountain. He recalled building it was a group effort: he did the stonework while former ‘Friends’ stalwarts Peter Weiss, Seth Silcock and Maurie Bowditch mixed the concrete. The quartet also built four bridges across the stream, dug out walking tracks and planted thousands of native trees. “We did a hell of a lot of work here,” Felix said proudly. The pond had been a swamp, a quagmire, he recalled. And rocks from the site were all dug up, wheelbarrowed and placed where they are today. By 2001 more than 13,000 trees had been planted by the volunteers. 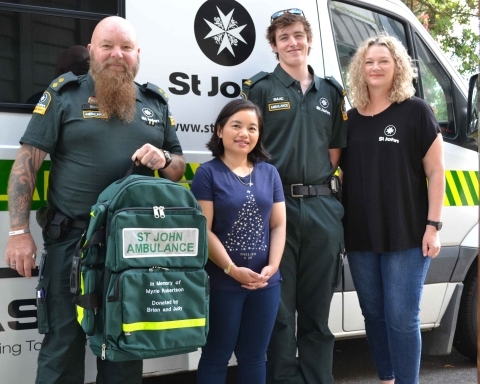 ‘Friends’ committee chairman John Lawson – a volunteer for the past decade, who turned up with the original minutes book in hand – reckoned there’s been “quite a lot” planted since then during fortnightly Monday morning work sessions. 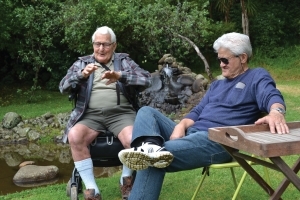 John thanked ‘Friends of Wainui’ members, past and present, for their commitment over the years along with that of others like environmental group A Rocha, which since 2009 has helped control predators in the park and surrounding reserves. 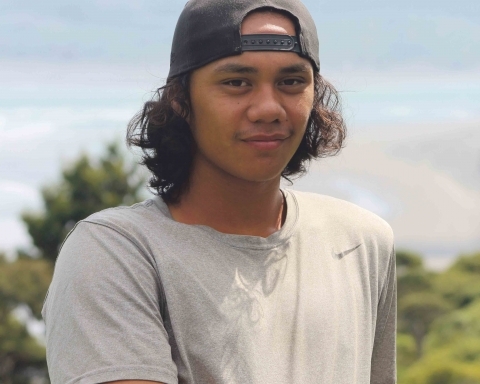 He also acknowledged the support of Waikato District Council, which was represented at the gathering by Raglan reserves team leader Noel Barber and open spaces team leader Duncan MacDougall from Ngaruawahia. “It’s only possible because you all help,” he said. * If interested in becoming a member of Friends of Wainui, the AGM will be held at the bush park gazebo on Monday November 26 at 10.30am.